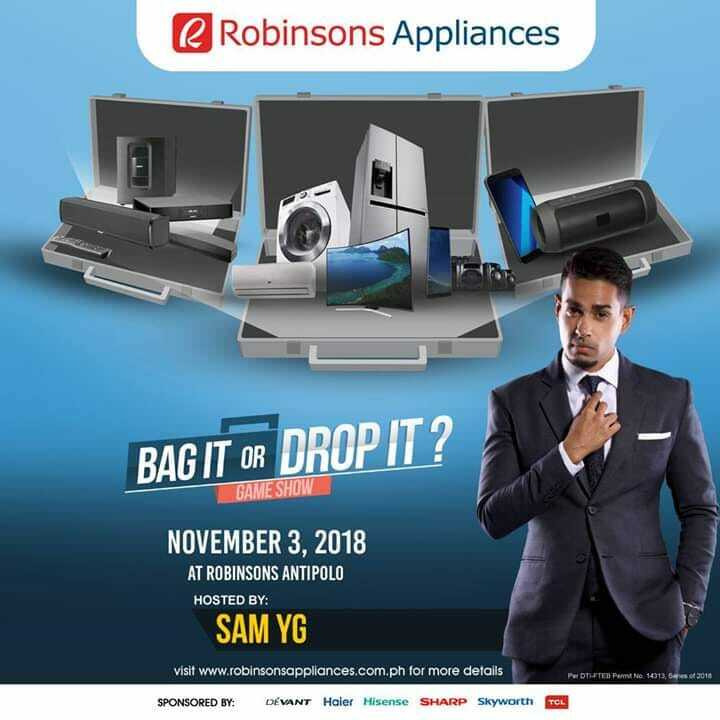 Hosted by TV personality and top Radio DJ Sam YG, the culminating event for the BAG IT OR DROP IT promo of Robinsons Appliances will be held today (November 3) at Robinsons Place Antipolo! Four (4) raffle winners, one each coming from Metro Manila, Luzon, Visayas and Mindanao, are set to play BAG IT OT DROP IT to get a chance to win up to 500,000 Pesos worth of appliances. Watch the game unfold at Robinsons Place Antipolo and you may also get a chance to bring home appliances and other exciting prizes from Robinsons Appliances as well. The BAG IT OR DROP IT game starts with 25 identical boxes, each with an appliance as a prize. The player must then select a numbered box at random. The player’s aim is to sell the box to the host, or the “Vendor,” for the most number or equivalent amount of appliance as possible. Once a box is chosen, the host will ask the player whether to “Bag It” or “Drop It,” which the player must answer, and a “Bag It” answer means the player accepts the host’s offer. The game then continues just to find out what the prizes in the other boxes are had the player carried on. If the player answers “Drop It,” it means the offer is declined, and the game continues. Boxes will then be opened in the succeeding rounds until only two boxes remain. All players will go home a winner but the challenge is to bring home the bag with the highest value! 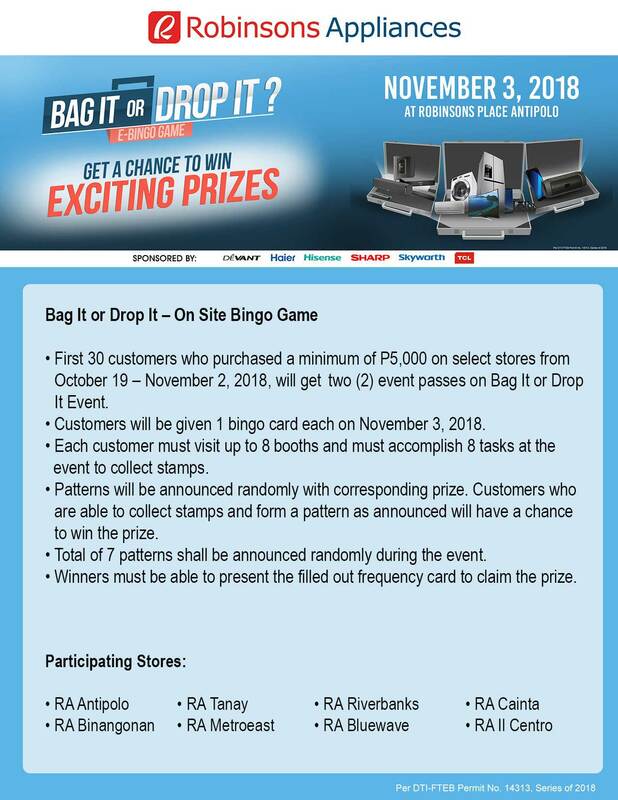 The BAG IT OR DROP IT raffle promo is just one of several activities lined up by Robinsons Appliances to show appreciation and to engage with its customers, Robinsons Rewards Card members and partner brands. At present, Robinsons Appliances operates close to 100 branches in key locations nationwide. Catch the BAG IT OR DROP IT game held today November 3, 2018 (Saturday) at the Events Center of Robinsons Place Antipolo, located along Sumulong Highway, Brgy. Dela Paz, Antipolo, Rizal. For more details, visit www.robinsonsappliances.com.ph or follow official Facebook and IG accounts of Robinsons Appliances.